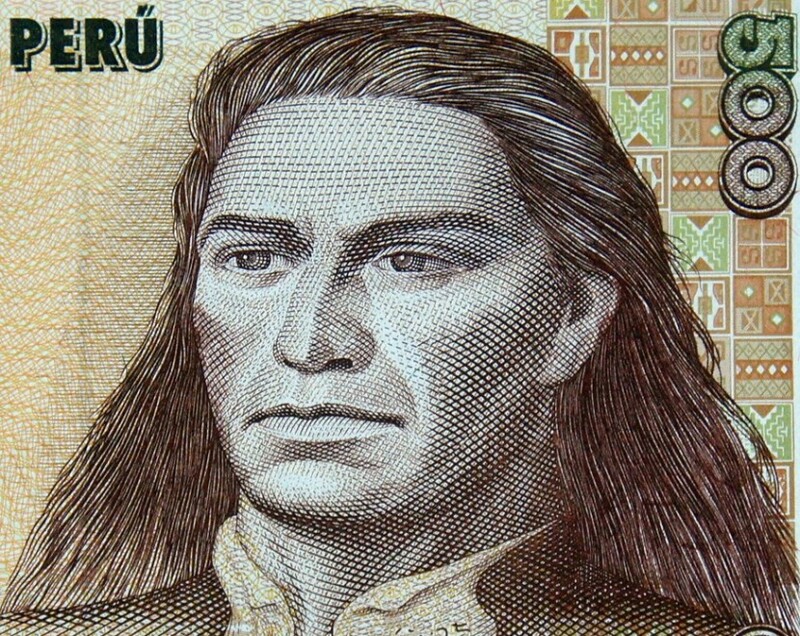 The 1987 Peru 500 Intis banknote features the famous Peruvian revolutionary leader Tupac Amaru II. Tupac was the leader of the indigenous Peruvians against the Spanish in Peru in 1780. Tupac was captured and forced to witness his family put to death. Later Tupac was executed and dismembered with his remains spead over towns and villages as a message. Tupac was considered an inspiration and symbol for the Peruvian struggle for independence. The Inti currency was named after the Inca sun god. The Init replaced the failed Sol currency after a period of high inflation in 1985. The Inti currency was only used until 1991 after more inflationary problems led to yet another currency reform. Only 4 years as a legal currency and limited printing the 1987 Peru 500 Intis banknote is a collectible memory of Peru and the legendary Tupac Amaru II.